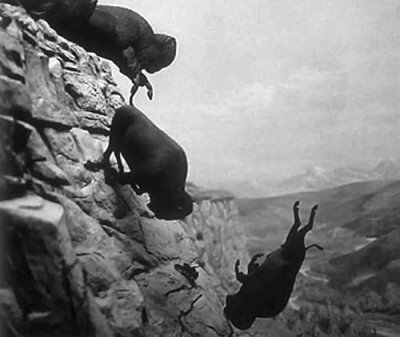 Failure to repeal Obamacare by January of 2013 will result in deadweight losses in the American economy. Although static revenue believers contend that the federal government will be able to line its pockets through a new source of revenue, inefficiency will occur in the private sector causing the loss of existing and future jobs, a decline in income tax revenues, less private sector health insurance coverage, and fewer business expansions. In fact, many small businesses will be left with lower revenues, after paying the so called shared responsibility penalty, causing them to either price themselves out of the market, downsize, or shutter, depending on market conditions. What is Deadweight Loss? – It’s an economic term which represents the costs to society created by market inefficiency. Deadweight loss can be applied to any deficiency caused by an inefficient allocation of resources. Price ceilings (such as price controls and rent controls), price floors (such as minimum wage and living wage laws) and taxation are all said to create deadweight losses. Deadweight loss occurs when supply and demand are not in equilibrium. To see how deadweight loss occurs with Obamacare, let’s use an expanded real world example. TEA, Inc. is a small Georgia based parts assembly plant with 50 full-time employees, not including its single owner. The company doesn’t provide health insurance for its employees due to a low profit margin, as doing so would impair its ability to continue as a going concern. However, the owner wants to expand in order to increase profits through horizontal integration. The company’s pre-tax net profit is projected to be $150,000 for each plant it operates, and each plant is expected to employ 50 full-time employees. Prior to the passage of Obamacare, TEA Inc.’s owner had planned on opening a second plant in 2012 and a third in 2013 creating an additional 100 jobs, but this misguided legislation has pretty much killed that dream. How’s that? Well, since TEA, Inc. already has 50 full-time employees, it will be required by Obamacare to either provide and pay for at least half the cost of health insurance for its employees in 2014, or pay a penalty of $2,000 on each (excluding the first 30). In analyzing the financial impact, TEA, Inc. determines that 25 of its employees will require family plans, and 25 will require self-only plans. TEA, Inc. expects the ratio of family versus self-only plans to remain about the same as it expands. In examining the average cost of small group premiums within the Georgia market, it is known that self-only plans cost an average of $4,612, and family plans cost $10,598 (see Obamacare’s Effect on Small Business). Prior to Obamacare, with its one existing plant, TEA, Inc. would have net income of $150,000, would pay federal income taxes of $41,750, and would be left with after-tax income of $108,250 (see table below). Assuming all things are equal, by 2014 when TEA, Inc. is mandated to provide health insurance at its existing plant, its health care expense will be $190,125 leaving it with a $(40,125) net operating loss, and no federal income tax liability. Since this is out of the question TEA, Inc. will be forced to either reduce its number of full-time employees to below 50, or pay a shared responsibility penalty (i.e. Health Care Tax). Since TEA, Inc. cannot afford to comply with the play portion of the “play or pay rules”, if it does not reduce its workforce before 01/01/2013, then by 2014 it will be forced to pay a shared responsibility penalty of $40,000 ($2,000 per person on 20 of its 50 employees). Since the shared responsibility penalty is not deductible for tax purposes, TEA, Inc. will still have taxable income of $150,000, will pay federal income taxes of $41,750, and will have after-tax income of $108,250. 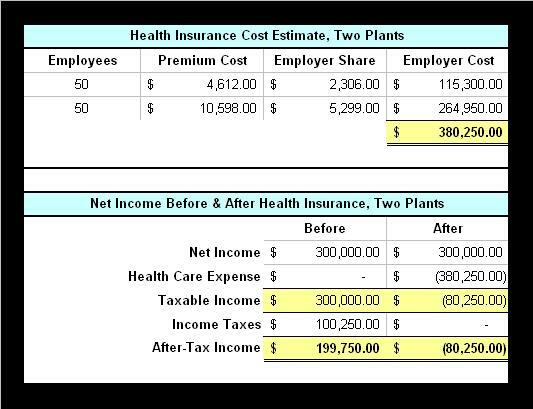 However, after paying the shared responsibility penalty, the company will be left with just $68,250 or $40,000 less than it would have had before Obamacare (see table below). What will TEA, Inc. do? Its owner only has 14 months to decide, because the penalty will apply in 2014 if TEA, Inc. still has 50 or more full-time employees in the year 2013 (see Obamacare’s Effect on Small Business). Options: If TEA, Inc. reduces its current workforce by one full-time equivalent employee, it can avoid paying the $40,000 penalty in 2014, but it must eliminate that position before the end of 2012, due to the twelve month look-back rule contained in Obamacare’s fine print. By doing so, TEA, Inc. will save the amount of one employee’s wages, less the increase in applicable federal taxes, and will avoid paying the $40,000 shared responsibility penalty, making the company better off. Unfortunately, this might be the best option available under the circumstances. So far, the deadweight loss is one full-time job. If TEA, Inc. opts to push ahead and open the second plant, prior to Obamacare it would have net income of $300,000, would pay federal income taxes of $100,250, and would be left with after-tax income of $199,750. 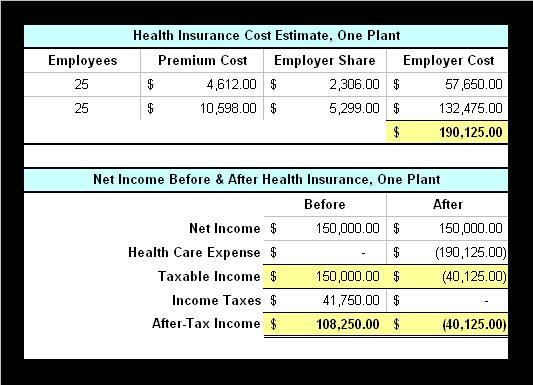 Assuming all things are equal, in 2014 when TEA, Inc. is mandated to provide health insurance at its old and new plant, its health care expense will be $380,250 leaving it with a net operating loss of $(80,250), and no federal income tax liability (see table below). Since this is out of the question TEA, Inc. will be forced to either forgo its expansion plans and not provide the additional 50 jobs, or pay the shared responsibility penalty (i.e. Health Care Tax). Since TEA, Inc. cannot afford to comply with the play part of the “play or pay rules”, if it proceeds with the expansion, then by 2014 it will be forced to pay a shared responsibility penalty of $140,000 ($2,000 per person on 70 of its 100 employees). 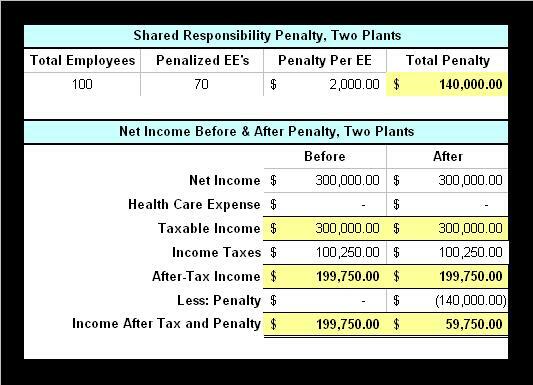 Since the shared responsibility penalty is not deductible for tax purposes, TEA, Inc. will still have taxable income of $300,000, will pay federal income taxes of $100,250, and will have after-tax income of $199,750. However, after paying the penalty, the company will be left with just $59,750 or $140,000 less than it would have had before Obamacare (see table below). It’s worth noting that even after doubling its profits, TEA, Inc. would be left with less money — $59,750, than it would have had with just the one plant — $68,250. Again, what will TEA, Inc. do? Its owner only has 14 months to decide, because the penalty will apply in 2014 if TEA, Inc. has 50 or more full-time employees in the year 2013 (see Obamacare’s Effect on Small Business). The best option appears to be to not open the second plant, and to reduce the number of full-time employees at the initial plant by one. Thus, the deadweight loss has increased to 51 full-time jobs. If TEA, Inc. decides to trust in “hope and change” and moves ahead with adding yet a third plant, pre-Obamacare it would have net income of $450,000, would pay federal income taxes of $153,000, and would be left with after-tax income of $297,000 (see table below). Assuming all things are equal, in 2014 as TEA, Inc. is mandated to provide health insurance at all three plants, its health care expense will be $570,375 leaving it with a $(120,375) net operating loss, and no federal income tax liability. Since this is impossible, TEA, Inc. will be forced to either forgo its expansion plans and not provide the additional 100 jobs, or pay the shared responsibility penalty (i.e. Health Care Tax). Since TEA, Inc. cannot afford to comply with the play aspect of the “play or pay rules”, if it proceeds with its expansion plans, then by 2014 it will be forced to pay a shared responsibility penalty of $240,000 ($2,000 per person on 120 of its 150 employees). 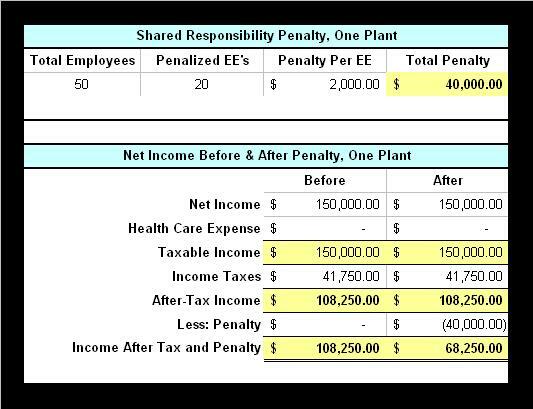 Since the shared responsibility penalty is not deductible for tax purposes, TEA, Inc. will still have taxable income of $450,000, will pay income taxes of $153,000, and will have after-tax income of $297,000. 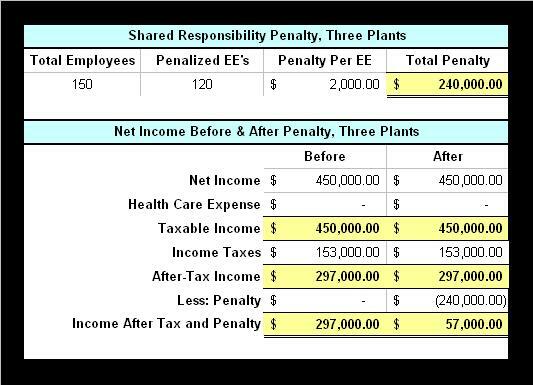 However, after paying the shared responsibility penalty, the company will be left with just $57,000 (see table below). It’s notable that even after tripling in size, TEA, Inc. would be left with less money –- $57,000, than it would have had with just two plants –- $59,750, and even less than it would have had with just the one plant –- $68,250. Again, what will TEA, Inc. do? Its owner only has 14 months to decide, because the penalty will apply in 2014 if TEA, Inc. has 50 or more full-time employees in the year 2013 (see Obamacare’s Effect on Small Business). The best option for TEA, Inc. appears to be to forget about opening a second and third plant, and to reduce the number of employees at its existing plant. By doing so, TEA, Inc. will be able to maintain its present after-tax net income of $108,250, plus the savings achieved by eliminating a job, which yields the optimal result. Thus, in this real-life scenario, the deadweight loss created by Obamacare is 101 full-time jobs. In addition, 49 full-time employees are left without health insurance, and by 2014 will be forced to either pay a tax or secure their own health insurance coverage. Failure to repeal Obamacare means that this entrepreneur’s dreams of expansion will be destroyed, and 101 potential employees will be left on the sidelines. Obamacare will impose unnecessary deadweight losses upon the American economy, which will be multiplied many times over.